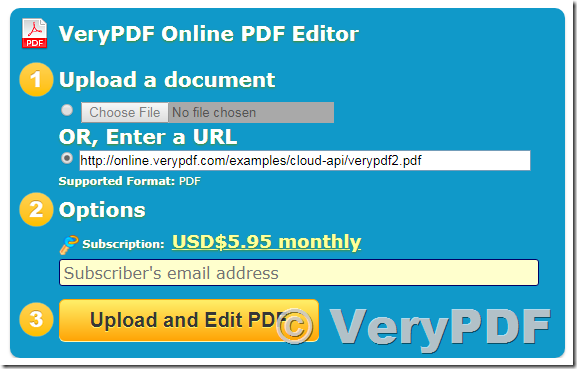 VeryPDF released an Online PDF Editor Web Application today. Online PDF Editor is a Web application which can be used to Edit & Sign PDF files online. You can use it to fill PDF forms, annotate PDF, add text, links, images and shapes to PDF pages. You can also use it to rotate PDF pages, clone PDF pages, remove PDF pages, move and reorder PDF pages and more powerful function. Your PDF file will be opened in an Online PDF Editor Web application, just like following screenshot, on the left pane, it's the PDF Page Master, you can rotate, crop, clone, delete and reorder PDF pages, on the right pane, it's the main PDF Editor Window, it allows you to add lines, add various kinds of shapes, you can also adjust the stroke color, fill color and opacity for these vector shapes, it's a powerful vector graphics editor. After you finish the editing, you can click "Save to PDF" button in the left pane, you will able to save to a new PDF file automatically. All works are finished in web browser completely, you need install nothing to your local system, so you can do all of these works in Windows, Mac, Linux, iOS, Android, etc. system. The online PDF editor is made to work on all Windows, Linux and Mac devices. No installation or registration necessary. It also works in all the popular browsers: Firefox, Chrome, IE & Safari. The tool operates 100% in the cloud on our secure servers. This way the editor is accessible everywhere. It also means no resources will be taken from your computer. Why Use A PDF Editor? Not anymore! 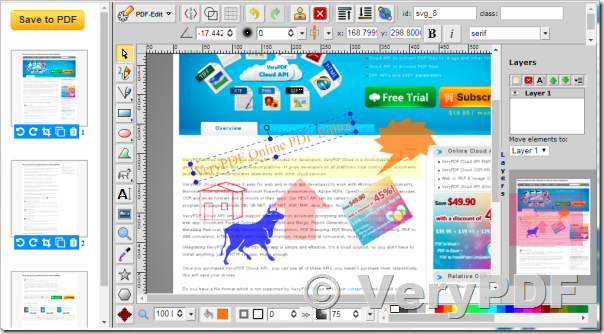 Using VeryPDF Online PDF Editor you can not only draw onto a PDF to your heart's content, but also add images and watermarks. Work with powerful editing tools. With full-page editing, when you add new text to a page, existing paragraphs will adjust automatically. And when you add new lines to bulleted lists, the formatting is added, too. We guarantee the privacy of your files as we don't backup, view or share them. All the uploaded files will be deleted permanently and instantly once you've finished using the provided tools. If you encounter any problem with our products, please feel free to let us know, we are glad to assist you asap. How to edit contents of PDF file? This entry was posted in PDF Editor, VeryPDF Cloud API and tagged annotate PDF, cloud API, comment pdf, crop pdf, delete pdf page, online annotator, pdf annotation, PDF annotator, pdf editor, rotate pdf. Bookmark the permalink.